I’d noted in my review of the last volume that “time is the root of all endings,” but in truth – and contrary to conventional wisdom – not even the passage of years puts trauma to rest. Time does not heal wounds neatly; it paves over them with scar tissue, that eternal and ugly and impossible to disguise reminder that we are not so whole as we once were and can never be so again. No matter how long it has been since we survived the horror, the experience will forever feel as if it happened only yesterday. Is happening to us again at this very moment. Such pain can be managed by a number of coping mechanisms – can be compartmentalized by confronting the source of the trauma, can be made bearable by allowing oneself forgiveness for wrongs one falsely believes to be of their own making – but it is only ever managed. It remains compartmentalized and distant only until the day an incidental trigger makes it once more inescapable. The real horror of trauma is that it is immortal. Gosho knows this, as do so many of us, and yet like so many of us she hopes that closure can be found by revisiting the site of her pain and witnessing that it is nothing timeless, but changed. Hopes that a relationship with the kind and outgoing Sudo would allow her to move beyond the deep distrust she’s felt since Sakurane’s betrayal, hopes that explicit forgiveness from Okazaki’s mother would allow her to absolve herself of the guilt she feels for failing him and her brother both. But of course it does not, because while Gosho has outwardly in the last decade, and has tried to move on, she knows in her bones the moment she witnesses how Okazaki’s mother has left his room untouched in the years since his disappearance that some part of her is still that 16-year-old girl bleeding out in a burning building. She can adopt a mask of steely determination before the gates of Sakurane’s Blood of Happiness compound, but there is no mistaking every bit of fear that resoluteness masks because so many of us have stood where Gosho stands. 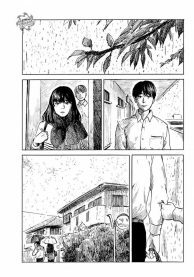 In large part this is attributable, as always, to Oshimi’s unequalled linework. While the breathtaking expressionist and impressionistic spreads that made earlier volumes of Happiness such a visual marvel have departed in the absence of Okazaki and his vampiric ilk, the lines in the figure-drawing have taken on something of those mystical qualities and so lend even a panel of Gosho smiling warmly an abstract and melancholy beauty. It’s a sense that pervades every panel in the montage at the center of the volume and saves it from feeling like any other generic montage of budding romance by casting Sudo and Gosho’s growing affections as a delicate affair, as tenuous and sad as it is hopeful. There is weight in their passing time that convinces us pages have spanned months, weight as well in the knowledge that this – unlike the horrors in Gosho’s head — cannot last forever, weight that is so much attributable to how finely Oshimi has sketched his characters both visually and psychologically. It is not simply that Oshimi’s characters are well defined in traditional terms, though they are. Any reader would have little difficult explaining the motivations and the character traits that distinguish each cast member from the other. Rather, what lends them such a compelling power– the same thing that lent Flower of Evil’s cast their hypnotic appeal – is that they are not developed simply. Which is not to merely say that they are complex. They are, but complexity alone is not a prerequisite for interesting or convincing characters. How many thrillers are bogged down with casts comprised entirely of walking complexes we forget within minutes; how many middle-brow novels about families of neurotics waging war against one another land with no impact because nothing about their endless tangle of hang-ups and hates seemed quite human? Rather, Oshimi’s greatest credit is that he has never seen the development of the psyche as a dialectic process pushing towards perfection. An obstacle conquered once is not a problem solved forever, he knows, just as our pain is not integrated seamlessly into some kind of indivisible and permanent self. 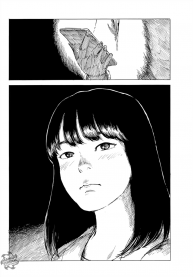 And so the same Gosho who a decade on collapses in a blubbering puddle after reading a headline that reveals Sakurane is still at large is recognizable as the same Gosho who fearlessly stood in the midst of a burning building and tramped while bleeding from her slit throat despite the massive disparity in courage because Oshimi has convincingly shown that our development is not a linear process as so much of modern talk of self-improvement presupposes. We aren’t merely the accumulation of this trauma nor even the conquerors of it; we regress and grow by the moment because what is past is never dead; it’s not even past. If Oshimi’s characters are not necessarily aware of this fact themselves, Oshimi most certainly is, which is what lends each of his creations such distinction and such striking power; it’s what make them so real. It’s what lends Happiness both its horror and its heart.